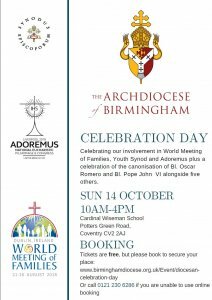 On behalf of the Archdiocese of Birmingham, Romero would like to invite you to the first Diocesan Celebration day on October 14th (10am-4pm) at Cardinal Wiseman Secondary School (part of the Romero MAC) in Coventry. There will also be an exhibition room for agencies, charities and organisations who are involved in the Diocese. Please do get in touch with Lianne Pap (lianne.pap@rc-birmingham.org) or Natalie Orefice (natalie.orefice@rc-birmingham.org) if you wish to have a stand. To book a free place click on the link below.